I was asked by Sephora to do a full makeup demo last Monday and thought I would share the results with you. Veronica and I had a blast. 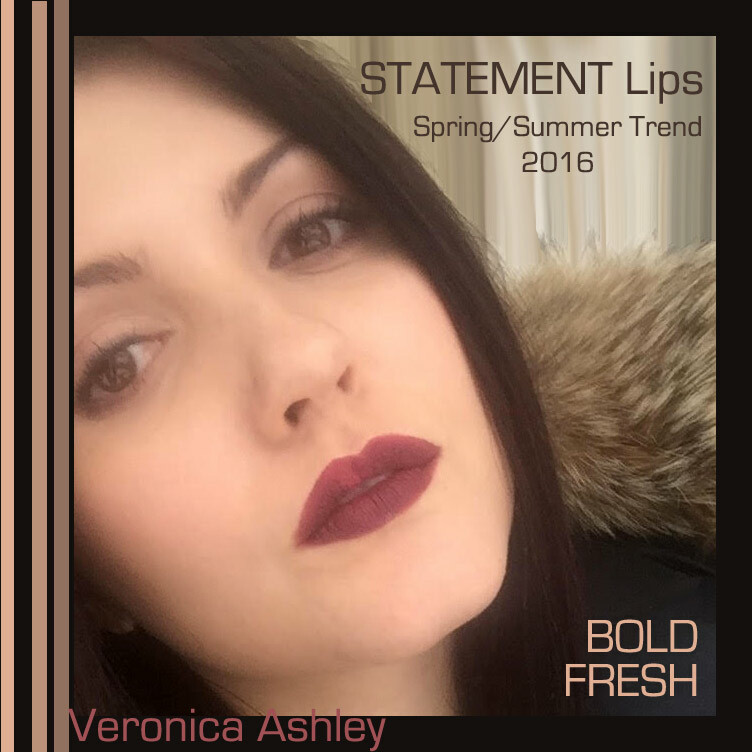 Together we decided to try out the new bold dark lip that is trending for the Spring/Summer 2016 season. It’s something that she has never worn as she usually plays up her big beautiful brown eyes and wears a pale lip but nothing ventured, nothing gained. To make this look work, you have to have only one focal point on the face…so to make the bold lip pop, I kept the eyes pretty but soft. First, we cleansed her skin and applied Benefit Cosmetics – The POREfessional Face Primer. I chose as her base a full coverage foundation from Dior – Forever Perfect Makeup and color corrected the redness on her cheeks and chin by combining the foundation with a little green veil and patting it on top of the foundation and blending well. We finished her foundation by setting it with MAKE UP FOR EVER HD Loose Powder. Brow Definer Line – the auburn shade to pic up the red in her hair and the dark brown used sparingly to add the neccesary deepness needed but keeping it natural looking. To play up her eyes, I first used a black liner that I smudged right into her upper lash line followed by some soft eyeshadow colors from two Urban Decay Eyeshadow Palettes. Naked2 and Naked3. Under her brow bone and on the inner corner of her eyelid I used the color Strange from the Naked3 Palette. On the outer 2/3rds of her eyelid I used Burnout from the Naked3 Palette. Lastly, to define her crease and make her eyes pop I used Tease from the Urban Decay Naked2 Palette. Followed by a light application of Lancôme DÉFINICILS – High Definition Mascara, in black. With a dark matt lip like this, it’s really important to make sure that your lips are moisturized really well. I applied a lip balm after cleansing her skin and let it sit on her lips until I was ready to apply her lipstick to make sure her lips were in peak condition. I removed any excess lip balm before I lined her lips with SEPHORA COLLECTION Rouge Gel Lip Liner in COLOR 12 the red – matte plum and then filled them in with SEPHORA COLLECTION Cream Lip Stain – COLOR 14 Blackberry Sorbet. PERFECTION! To finish the look, I applied a little powder contour to the hollows of her cheeks and temples and added a dash on MAKE UP FOR EVER Blush – Color 10 to her cheek bones. So that’s my take on how to rock a STATEMENT Lip. Veronica and I had a great day together, she loved the new look and we both really enjoyed our time at Sephora. Wow! All I could say is wow! I love the lip you did an amazing job on this makeup! Wonderful!!! wow, Veronica you look stunning! You are meant for modeling. Who is Jacques Deschamps Derge?